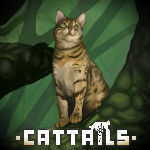 First Play Session as a Cat | Cattails: Become a Cat! Instead of recording, I decided to take notes so forgive me if the dot points are really vague. As a disclaimer, I never take notes on a game. This is the first and only game I've done this for. Also, I found this description funny. Especially the last line. You're gonna need to click or tap on it to see what I mean. - Heron has a cream pelt with pink eyes. - Met Coco after getting thrown out. Coco is a black and white cat. - Tasked with finding Goldenleaf, a medicinal plant. are a few named plants and have unique uses. - Some plants grow back and some plants only grow in specific seasons. - Eat regularly to stay healthy and alive. - Berries and licorice root are good in a pinch but actual prey is better. - Learned SPRINT! (Final Fantasy victory theme plays). - Able to have four active skills at a time. - Hunting, foraging, swimming, and fighting are passive skills. - Passive skills can be upgraded at any time. - Active skills can only be equipped or unequipped in my den. - Cats don't like intruders. Shocking. - Participate in skirmishes, help specific colony gain influence. - Headed to Forest Colony. - Found my den too! - Coco just teleported ... she's magic!! - Gained custom colour. Looks gooood. - Went out of my den upon waking up. - Met the lead cat named ... Mayor. - Ember is a shopkeeper. - Doc is a healer. Go figure. - Found Mayor's den on the island behind my den. - Found Ember. Seems nice. Inventory Expansion for 100 Mews. Black Pelt Colour for 120 Mews. Red Pelt Colour for 120 Mews. Orange and White Pelt Colour for 180 Mews. Black and White Pelt Colour for 180 Mews. Orange Tabby Pelt Colour for 225 Mews. Light Orange Tabby Pelt for 225 Mews. Brown Tiger Colour for 225 Mews. Ticked Grey Pelt Colour for 225 Mews. Red Scarf for 70 Mews. - Found Ember's den behind her shop. - Found Doc. Not that interesting. - Found Doc's den. He was standing right in front of it. - Found Missy. She's snobby for a cat. And is too self-important for her own good. Ugh. - Found Missy's den. Smells just as fruity as her! - Found Scout's den. Where's Scout? Has lots of prey inside though. Yummy! - Found Lyrus. Kinder than Missy at least. And a poet. - Found Lyrus' den. It's behind him. He decorates like a hippy. - Tried swimming. Immediately got hurt from swimming for too long. - Killed a butterfly. Can't eat it. - Killed two fireflies. Can't eat them. - Sold the butterfly and fireflies for 3 measly Mews. - Finally killed two mice. - Back to full satisfaction. - Walked through WESTERN FIELD. - Walked through CANYON RUINS. - Walked through CANYON PLAINS. - Molo wants me to nab a couple gems. He loves how they Sparkle. - Found Furball and Sweetie. Cats from Fire Clan? - Ran back after Sweetie and Furball attacked me. - Ran through THE FAIRYWOOD and FOREST CENTRAL. - Mayor concerned for me after we talked. - Doc is too expensive. - Sold Catnip to Ember for 15 Mews. - Travelled through FOREST CENTRAL. - Travelled through THE FAIRYWOOD. - Found skirmish at FOREST EAST. - Won skirmish for FOREST CLAN. - Found Slate and Admiral in the skirmish. Fun! It seems simpler than recording, yet more time-consuming.